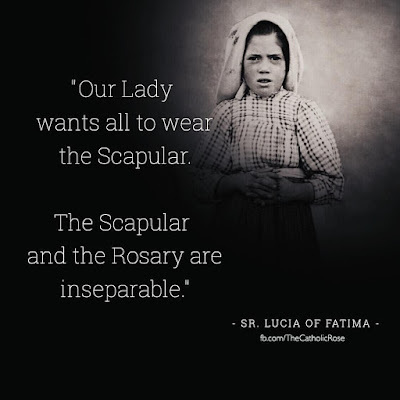 What is the link between Our Lady of Fatima and Our Lady of the Mount Carmel, since she appeared wearing the Carmelite habit in one of the apparitions? You know that at the Fatima apparitions Our Lady normally wore a white habit with a gold trim and a gold belt at her waist. But during an apparition to the children when the miracle of the sun occurred, she appeared wearing the Carmelite habit representing the glorious mysteries of the Rosary. Our Lady does not do anything by chance, so the first question leads to another: What is the relation among Our Lady of the Carmel, the glorious mysteries and Our Lady of Fatima? The invocation of Our Lady of the Carmel originates from Mount Carmel in the Holy Land, where hermits used to live at the time of the Old Covenant praying and waiting for a Virgin-Mother who would come and bring salvation for the whole human race. They were following the example of Elias, the Prophet, who was at Mount Carmel praying for the salvation of Israel, which was passing through a terrible drought, when he saw a little cloud in the distant horizon. He hoped that it would bring the much-needed rain to Israel. The small cloud grew in size and covered the whole sky, and finally the hoped-for rain came to save the people. 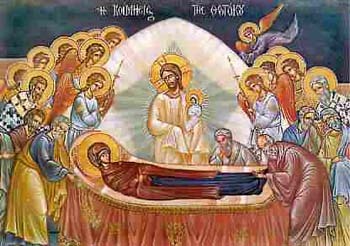 Elias understood that this cloud was a symbol of the Virgin to come, related to the prophecies of Isaiah that spoke of Our Lady. Those who followed his example also prayed for the coming of the Virgin who would be the Mother of the Messiah. In Old Covenant times, therefore, the hermits of Mount Carmel had the spiritual mission of foreseeing the coming of Our Lady and praying for it. They were persecuted by evil people, and also by members of the decadent Synagogue; notwithstanding, the hermits of Mount Carmel remained faithful. Finally, Our Lady came, and she received the greatest glorification of any living creature: in her the Divine Word, the Second Person of the Holy Trinity, was made flesh. She became the spouse of the Holy Ghost. Since she was without original sin, she was not subject to death. But she chose to die, to imitate Our Lord. So, she had a very easy death, which the Church with her skillful language called the dormitio, the sleep of Our Lady. It was an actual death that entailed the separation of body and soul, but as smooth as possible. Afterward, she was resurrected by Our Lord and carried to Heaven by the Angels. This ensemble of privileges constitutes the greatest glorification a creature had ever had. It is because of this that Our Lady of the Assumption is also called Our Lady of the Glory. Therefore, the history of the Order of Carmel in the Old Testament closes with an extraordinary glorification and the fulfillment of its expectations. Through centuries of silence, isolation, and persecution, the followers of Elias advanced step by step to the victory and glory. The history of the Order of Carmel begins again in the New Covenant. St. John the Baptist was also a follower of Elias, as were many of his disciples, St. John, St. James and others. They had the joy to see and know Our Lady while she was alive. They venerated the same Virgin-Mother who had been anticipated by all their ancestors. One can easily imagine that at times she would speak to them as Carmelites and confirm their vocation and reward them for being her first devotees in History. One also can imagine the pious and mysterious relations between Our Lady and Elias, who is still alive, as you know. 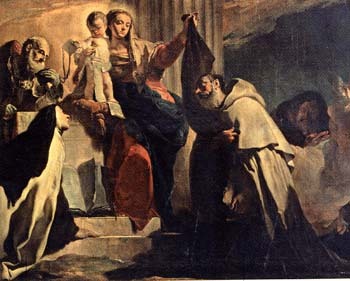 It seems reasonable to think that the devotion of Holy Servitude (Holy Slavery) to Our Lady, developed by St. Louis Grignon de Montfort, was somehow known and practiced by those first sons of Our Lady, the Carmelites. The Carmelite Order continued to exist in the Holy Land, but the Christendom of that time did not take the advantage it should have taken from its presence. That Christendom entered into decadence, and as punishment received the invasion of the Saracens, which destroyed it. At the time of the Crusades, the Carmelites came to the West as an almost unknown religious order, waning and without supporters. On this shriveling trunk Our Lady made a vibrant flower bloom – St. Simon Stock. After he was elected General of the Order in 1247, he asked her protection for the Order. She appeared to him and gave him the scapular, that is, the promise of eternal life to those who would enter the Order and die in it. The Order bloomed again, and a new period of glory came to it. 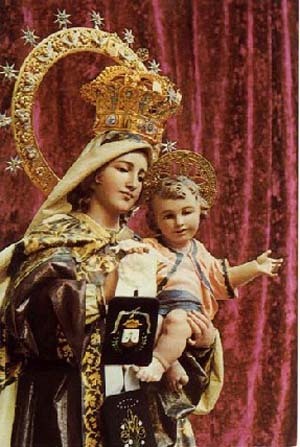 Among the glories of the Carmelites, its greatest is to always have had devotion to Our Lady. It also had the glory of having a St. Teresa de Avila, and more recently the glory of having St. Therese of the Infant Jesus, who could be our contemporary if she would not have died so young. Today Christendom is again in decadence. Our Lady came to Fatima to announce this fall, the chastisement, and the victory with the famous phrase: “In the end my Immaculate Heart will triumph.” In that same set of apparitions in which she announced her victory, she desired to appear in the habit of the Carmelite Order, as a way to confirm her age-old predilection for it and to indicate that this Order will be a part of her glorious Reign. With the habit, she symbolically made a synthesis of the past and the future, at the very moment that she announced the end of an era and the beginning of another. The feast day of Our Lady of Mount Carmel is a very dear feast to us, followers of Elias the Prophet, the first devotee of Our Lady in History. Let us glorify her and ask her to prepare us, who are Carmelites in spirit, to pass by the chastisement and to be living stones in the Reign of Mary.